We are pleased to announce that Alex W. Friedrich from the University Medical Centre Groningen in the Netherlands and Maurizio Sanguinetti from the Catholic University of Sacred Heart in Rome, Italy, will join the ESCMID Executive Committee in April 2016 as representatives of clinical microbiology. Evelina Tacconelli from the University Hospital Tübingen, Germany, has been successfully re-elected for a second term representing infectious diseases. On behalf of all our colleagues, we heartily congratulate the re-elected and newly-elected officers. We are looking forward to their much valued contributions to the society. We also thank all candidates for their interest and for actively participating in the electoral procedure. This year’s EC election has seen a record participation from its voting members. We thank you for your lively interest in our society. 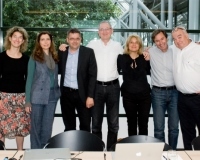 The new composition of the ESCMID Executive Committee will be effective as of the Assembly of Members during ECCMID in Amsterdam from 9 – 12 April 2016. There is a job opening for a postdoctoral fellow in the field of anti-infective pharmacology in the context of intracellular infection at the Louvain Drug Research Institute in Brussels, Belgium. This clinical three-year position is part of a transnational project financed by the Joint Programming Initiative on Antimicrobial Resistance (JPIAMR). The University Hospital in Tübingen has an open post-doc position in infectiology. The researcher will conduct systematic reviews and meta-analyses to forecast the clinical development of multi-resistant microorganisms and predict future needs for antibiotics. We have received a record of 4,648 submitted abstracts for ECCMID. The review is scheduled to be completed by the end of the year. The programme committee will meet in January and inform submitters about acceptance of their abstracts by the end of January at the latest.